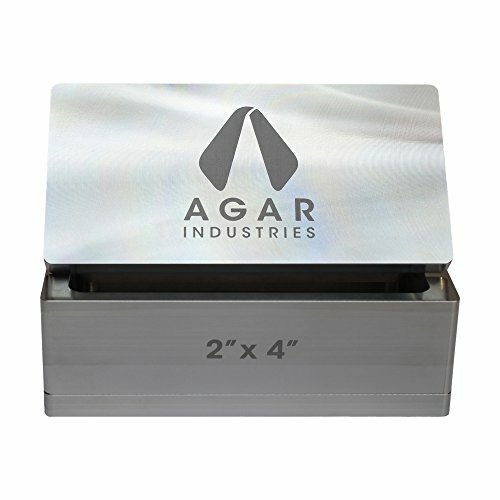 We at Agar Industries are dedicated to providing the tools that rosin enthusiasts need to have the most successful yields. We've produced a high quality pre press mold that streamlines your process by condensing loose, messy material into a compact and uniform shape that slips neatly and efficiently into your micron bags. Plus, pre pressing your material helps you reduce the risk of blowouts, improve the ROI and consistency of your yields, and save production time by allowing more material to be pressed at once. Brand-new rosin pre press mold designed for pressing flower. Constructed from heavy duty, 100% food safe aluminum. AN ESSENTIAL TOOL: Condense loose, messy material into a compact and uniform puck that slips neatly and efficiently into your micron bags. Ideal for 2" x 4" rosin bags but can be utilized with larger bags too. TREAMLINE THE PROCESS: Compressing your material with this mold reduces the risk of blowouts, improves the ROI and consistency of your yields, and saves production time by allowing more material to be pressed at once. BUILT TO LAST: Constructed from heavy duty, 100% food safe aluminum for optimal results and long-lasting durability. DIMENSIONS: External dimensions: 2" x 4"; Internal dimensions (press plate): 1.6" x 3.5"
HIGH STANDARDS OF QUALITY: Professional factory production, ships from the USA. If you have any questions about this product by Agar Industries, contact us by completing and submitting the form below. If you are looking for a specif part number, please include it with your message.